Weight at Rescue: 250 lbs. Jynxie was born at a sanctuary in 1998 in Mississippi where her parents had been rescued from a very poor situation. In 2001 Jynxie and her brother traveled to a sanctuary in Texas where they lived together until 2008. Jynxie’s brother died leaving her to live alone for the rest of her life. Jynxie was introduced to two other males in an attempt to give her companionship. She did get along very well with one of the boys but seemed a little intimidated by the other. For her comfort she was taken to an area that enabled her to live next door to the males so she could visit through the fence, but still no real company. Now that her second home has decided to close down, Jynxie needed to be moved again, leaving behind the only friends she has known for the past 9 years. In-Sync had been contacted a couple of times to help in relocating some of the other cats that needed placement, but since we were already a little crowded we were unable to help at that time. 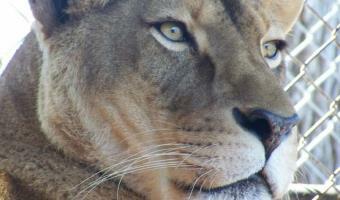 On October 28, 2010 we were left with a huge vacant hole in both our hearts and one of our lion enclosures by the passing of our beloved Malikai. Not only were we left with this sadness, but Malikai left behind a brother, Dinari, that now would have to live the rest of his life alone. We contacted the facility to ask if they were still looking for placement for one of their female lions and as fate would have it they still needed a home for Jynxie. On November 12th we brought Jynxie home. She has settled in very well and is very social. She loves attention and responds to every coo and awe we give her. Jynxie loves to play with buckets and kick a ball around in the playground. She loves to tease Dinari through the fence and keeps his attention pretty well. 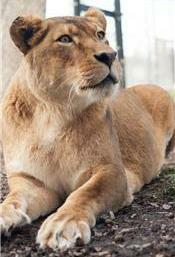 In the spring we plan to have her spayed then introduce her to sharing an enclosure with Dinari. We know we will never be able to replace the love and connection they shared with their siblings but we are very optimistic that they will be great companions for each other and make each other’s lives much more enriching.